JUST REDUCED AND PRICED TO SELL! 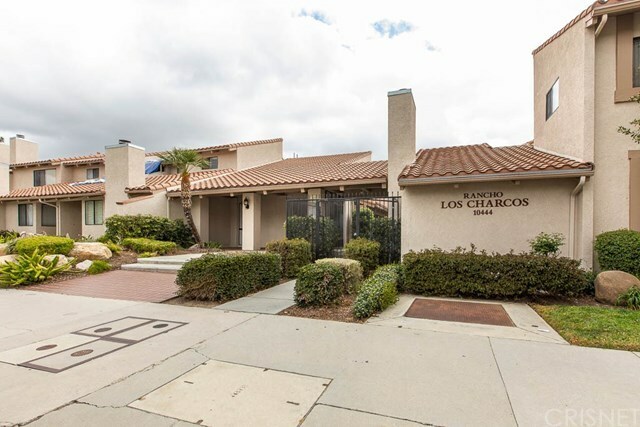 Welcome home and take a look at this BEAUTIFUL "Racho Los Charcos" Chatsworth Townhome! This spacious & private end unit boasts over 1,800 sq. ft. of living space and offers a tri-level layout with dramatic wood beam vaulted ceilings throughout. Enjoy the light and bright living area with laminate floors, plantation shutters, gas fireplace, and even it's own private patio. With two dining areas, breakfast nook, and ample cabinet-space - the cook of the home will love to entertain! Notice the over-sized Master Bedroom with a computer nook, ensuite bath, and walk-in closet. This home features two other bedrooms (including another bedroom with an ensuite bath), in-unit laundry, and a strikingly LARGE basement that can be used as a den, office, or playroom! 2 car attached garage with direct access. Close to freeways, shopping, dining, and parks!